On Tuesday, Microsoft announced the preview version of Windows 8.1 for enterprises, bringing all of the functionality of WIndows 8.1 to big business, with specific improvements for enterprises. Microsoft also reiterated that the corporate lifecycle of WIndows 8.1 would remain the same, and extend through January 10, 2023 for both the consumer preview as well as Windows 8.1 Enterprise. Microsoft didn't say when it would release Windows 8.1 Enterprise for general availability, but did say that the Windows 8 customers would have two years from that future date to shift over to Windows Enterprise 8.1. "We encourage customers to start testing the Windows 8.1 Enterprise Preview now!" Erwin Visser, senior director for Windows Commercial, said in a blog post. Microsoft announced the consumer preview of Windows 8.1 last month, complete with useful features that include a revamped Start screen, the ability to boot directly to the Windows 8 desktop, and other useful enhancements including a reorganized apps screen. All those have been carried over to Windows 8.1 Enterprise, as well as numerous additions that Microsoft believes will benefit enterprises. At the time, Microsoft also revealed several features of Windows 8.1 that it felt would be useful to businesses, including the ability to lock down a device to a single application, known as assigned access; workplace join; and the the ability for businesses to "kill" corporate data that appeared on a user's Windows 8.1 PC. A Windows to Go creator tool. Windows to Go allows admins to create fully bootable Windows drives allowing employees to port their desktops from PC to PC. 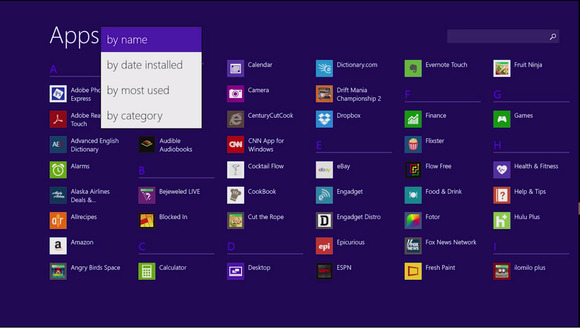 Start screen controls that allow admins to control the layout and make sure important corporate apps are easily seen. Direct Access, which allows remote users to access corporate resources without tapping into a VPN. BranchCache, which allows frequently-accessed data to be "cached" in branch offices without the need to constantly re-download it. Virtual Desktop (VDI), which allows users to tap into the power of a Windows Server 2012 to remotely render graphics, use touch devices and USB peripherals without a powerful local client. Apps can now be side-loaded onto PCs, and the client can be locked down to run only apps and files selected by the admin. A list of other business-specific features is here, Microsoft said. Microsft rode an early wave of corporate client adoption, reporting healthy growth in its Windows division soon after the launch of Windows 8. With the new enterprise features, Microsoft is undoubtedly hoping that hope its key corporate customers remain interested.